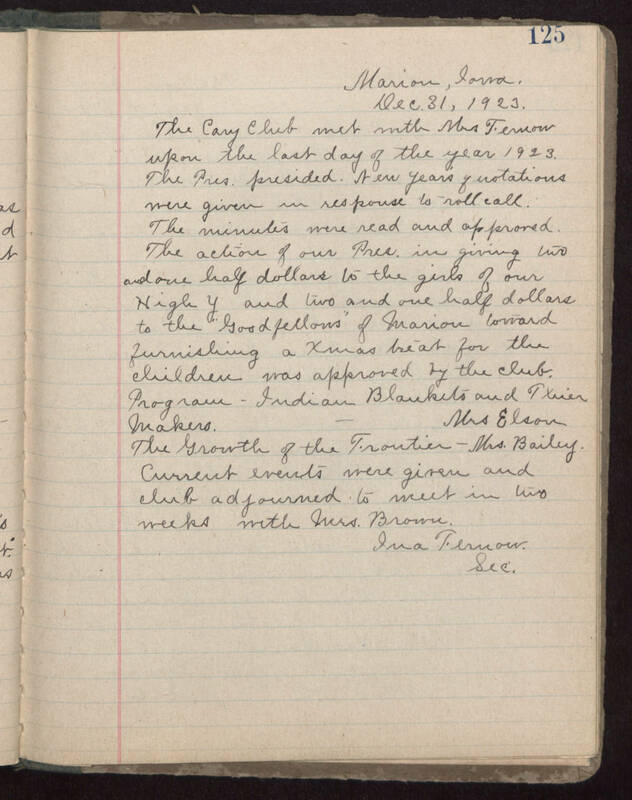 Marion, Iowa Dec 31, 1923 The Cary Club met with Mrs. Fernow upon the last day of the year 1923. The President presided, New Years quotations were given in response to roll call. The minutes were read and approved. The action of our President in giving two and one half dollars to the girls of our Nighy and two and one half dollars to the Goodfellows of Marion towards furnishing a Xmas treat for the children was approved by the club. Program - Indian Blankets and Txier Makers - Mrs. Elsan The Growth of the Frontier - Mrs. Bailey Current events were given and club adjourned to meet in two weeks with Mrs. Brown Ina Fernow. Sec.